50th All-Star Game Comiskey Stadium - Unautographed (1983). Only A Few Left - NO DISCOUNT. 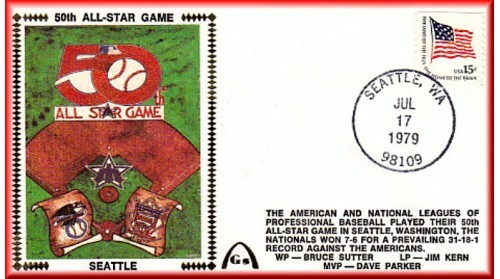 Postmarked July 6, 1983, Chicago, IL - 50th Anniversary Of The First All-Star Game, 9 Different Designs. Includes 3 Scott Forst Artpieces, Old Time Batter Old Time Player With Crossed Bats And Comiskey Park On Green Background. Choose The Artpiece For Each Autograph, Will Try To Provide It For You: $70--Ozzie Smith/Willie McGee Combo: $50--Andre Dawson: $40-- Rick Honeycutt/Steve Sax Combo: $30--Cecil Cooper, Ted Simmons Or Willie McGee: $20--Atlee Hammaker, Rick Honeycutt, Terry Kennedy, Ben Oglivie, Pasquel Perez, Ron Kittle, And Lance Parrish. $45--Unautographed Comiskey Park Scott Forst Artpiece - Sold Out (Only 12 Left In Stock To Sell): $10--Unautographed Artpieces.There Were 6 Game Photos, 3-National League Players, (Gary Carter/Ted Simmons, Mario Soto And Dale Murphy/Ted Simmons: Autographs Available - $40--Gary Carter Or Ted Simmons: $30--Mario Soto: And 3 American League Players, Robin Yount/Fred Lynn/Jim Rice, Dave Stieb, And Jim Rice Autographs Available - $85--Robin Yount/Fred Lynn Combo: $60--Fred Lynn/Atlee Hammaker Combo: $50--Robin Yount: $40--Fred Lynn: $10--All Unautographed National League & American League Silks. We Created Only 500 Of Each Envelopes.